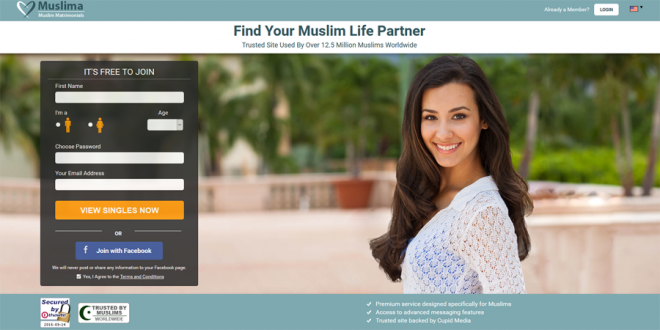 Muslima.com opened its doors in 2007 and since then it’s attracted a huge following of people from around the world. Some are seeking their marital partner some are just looking for a soul mate or friends. Compared to Shaadi, Qiran and others, Muslima is certainly not a faith site or matrimony site of any description and doesn’t pretend to be. There are no restrictions or limits on your background or what type of relationship you want. You don’t have to be Muslim though most are. You don’t have to be seeking marriage. It is a simple open forum where people decide for themselves and search for whatever they are looking for in a partner. Keep in mind that not everyone on Muslima is looking for a traditional Muslim marriage. Once you’ve done the registration formalities you’ll be able to create your profile. There are a few parts that you’ll need to complete before you get going. The first is the “About me” section. This is self-explanatory and you just need to enter your basic details such as age, where you live, what you look like, and what you are looking for and so on. Then upload a couple of photos. That’s the bare minimum. Tip • To get off to a great start you can also do the Cupid compatibility test. This is a simple personality test. It will help to pair you with people who have the same kind of personality as you do the same beliefs and hopefully who want what you do. There are a few things that are specific to the Muslim faith but more or less it is left to you to put any relevant information into the fee text area on your profile. Most people elaborate here and explain a little about their background and beliefs. Muslima has quite a simple membership policy. As a free member you are allowed to send messages to anyone. If you happen to send a message to another free member that message is locked up in their inbox and they won’t be able to read it until one of you upgrades. If you happen to send a message to another free member that message is locked up in their inbox. Once you’ve upgraded all blocks are removed and you can instantly message anyone on the site – and more importantly they can contact you as well. Any locked messages in your inbox or in people’s inboxes that you’ve contacted will also be unlocked so they can be read. There are two levels of membership available. The Platinum membership is there for you if you want a few extra privileges and perks. For most people the Gold will suffice. You can also go on the look yourself using Muslima’s advanced searches. These let you narrow down choices by more or less anything you choose. You can enter details about their age, beliefs, their location, who they are looking for…. The search is very easy to get to grips with and you’ll soon have good matches showing up in your activity bar. Hint • Of course if you’ve done your personality test too that will instantly give you an advantage. It means more people will be able to find you if they are looking for someone like you. And just as importantly if they match you too. If you don’t do this you miss out on that opportunity. Keep in mind that not everyone on Muslima is looking for a traditional Muslim marriage. There are a lot of people searching for other kinds of relationships too. Some are certainly not looking for marriage but seem to be hoping for something towards the “friend zone”. At the other extreme there are guys who’ll propose marriage after a few days! To avoid misunderstanding and disappointment it’s best to be clear in your profile about what sort of relationship you are looking for. If you aren’t looking for marriage say so. If you are looking for marriage be clear about that too. Some people get family members to write their profiles for them. Summary : Muslima is one of the biggest meeting places for single Muslims looking for their life parter. Members can create their own personal profile stating their ideal relationship. Betty Zhao is an avid blogger. She writes on love and relationships. In her spare time, she cooks and cares for her elderly relatives. Previous: IndonesianCupid – Uniquely Asian Dating? Next: JapanCupid – Searching Japanese Singles?